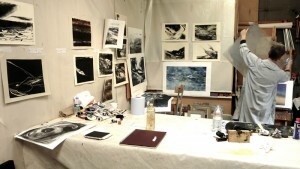 I am an artist specializing in drawing and printmaking and have a studio on the south coast of England. After studying fine art at Chelsea School of Art, I went on to make a living working with photographers. I now spend my days in my studio in the heart of Hastings Country Park. My subject is the landscape with a particular focus on the sky and earth and how they meet. My mark making records the certainty of this meeting point as well as the surprising and sometimes awkward man made interruptions. Being in the landscape in all weathers is crucial to my understanding and refining of the experience of being an artist and brings wonderful challenges and insights. 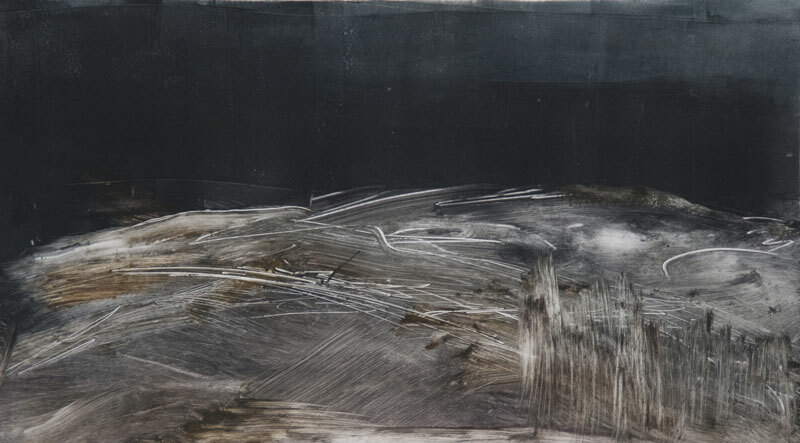 My response to the landscape is an emotional one and one that I do not confine to either paint or drawing materials. I often work outside and my initial response needs to be recorded with an immediacy, both gestural and dynamic. The ideas I bring to the studio are a strata of memory, which reveal themselves through the application of charcoal,ink,paint to a variety of surfaces. 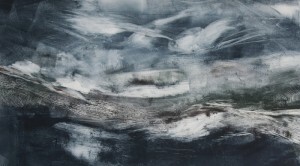 Monoprinting is a a painterly form of printmaking which simply involves the use of ink or paint applied to a flat surface which is then transferred by pressure onto paper. Sounds simple, but the huge range of possibilities both in mark making and range of materials is endless and I find the possibilities incredibly exciting. The results can range from being ‘simple’ single prints to a more complex, process involving multiple layers. My preferred way of working is to fully ink the plate and then create an image by removing the ink or paint with a variety of tools such as pan scourers, rags, cotton buds, fingers, kebab sticks and anything else to hand. I try to work with a clear intention of idea and not solely rely on magical surprises. 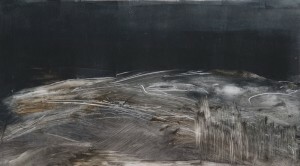 As with my painting and drawing I am looking for ways to express the layers within the landscape, seen and imagined. The shapes and marks I make when printing are usually informed by my looking and drawing whilst outside. I sometimes also use photography to store my ideas.